Located in the UPPER Land Park suburb of Sacramento, Reclamare is a Tattoo Studio offering custom services to clientele. Reclamare Tattoo + Gallery, RCLMR for short, opened in November of 2012 by local artist Corey Bernhardt, and was Upper Land Park's first Tattoo Studio. Since then, the shop has welcomed a team of artists from all over Sacramento to collectively thrive together, curating a body of work that has established Reclamare as a prominent part of the neighborhood. In addition to tattoos, most of the artists at Reclamare paint, and their works of art line the walls, giving our customers the subtle feeling of a gallery setting as they wait for their tattoos. Primarily an appointment only shop, RCLMR is open 7 days a week from 12p-7p, however you are welcome to stop in without an appointment to come see the space, admire the art, and ask questions about the tattoo process. All of the artists working at Reclamare are what you would describe as Custom Tattoo Artists. Not operating as a Traditional "walk-in" shop, we do not have pictures of flash on the walls to choose from. Instead each artist draws their designs based on their interests as well as the interpretations of their clients ideas. In addition to Custom Tattoo Work, our artists often have a collection of personal flash available to be tattooed, Personal Flash is predrawn artwork by each artist that is released on a first come first serve basis, either via instagram or in their individual books of "available designs" on our front counter. *BOOKS CLOSED* - openings will be announced on Instagram. Corey has been tattooing since 2009 but has spent most of his life dedicated to art. With a love for painting, mostly with oils, he can often be seen taking mini breaks from tattooing to dedicate time to fine art. This helps him to naturally improve artistically, both traditionally, and in the tattoo world, and has helped shape his style today. 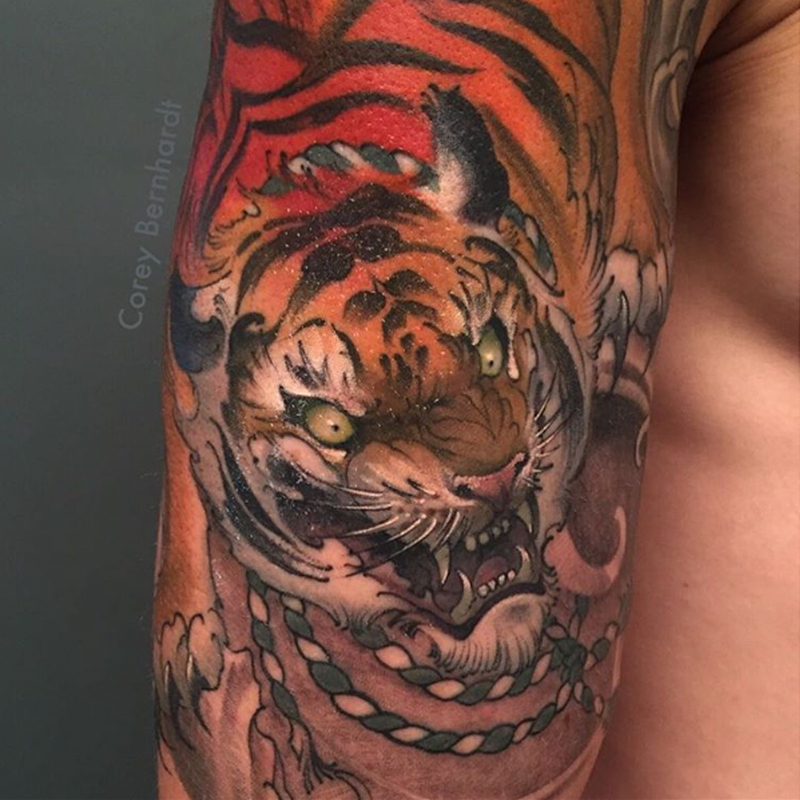 His tattoos are primarily illustrative, however in addition to the Illustrative style, Corey likes to work in his interpretation of Neo-Traditional and Japanese. His favorite subject matters are animals, insects, fruit, flowers, and fungus, combined with interesting objects for them to interact with. Jess has been tattooing since 2010 and has developed a style best described as "whimsical traditional." Her heavy influences from Traditional, Neo-Traditional, and New School tattoo styles, combined with bright and pastel color pallets, have shaped Jess' tattoo work into a signature style. She enjoys tattooing anything witchy or Harry Potter related, pop culture, flowers, insects, food, and just about anything that could be considered cute, fun, colorful, or nostalgic. Dave has been tattooing the longest out of all of the artists at Reclamare. With over 20 years under his belt, he is extremely versatile and talented in several tattoo styles. 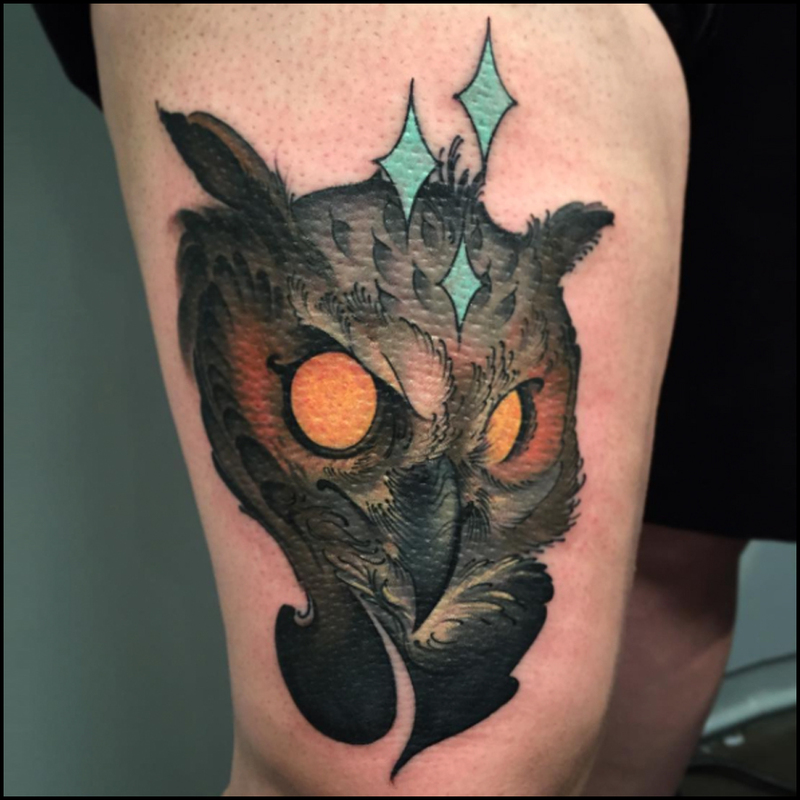 His work is most notably inspired by Japanese imagery, but he enjoys tattooing in a wide range of styles, both in color and black + gray. He doesn't have a favorite subject matter, and likes tattooing most things, except, as he was quoted, "trees." Josh began his tattoo career in 2009 and joined the crew at Reclamare in late 2013. Over the years he has developed a styled of tattooing best described as detailed, with varying line weights, and a mostly muted color pallet. Imagery that Josh most often enjoys tattooing is floral work and bouquets, plantlife, birds, animals, and line centric pieces. He works in both color and black + gray. 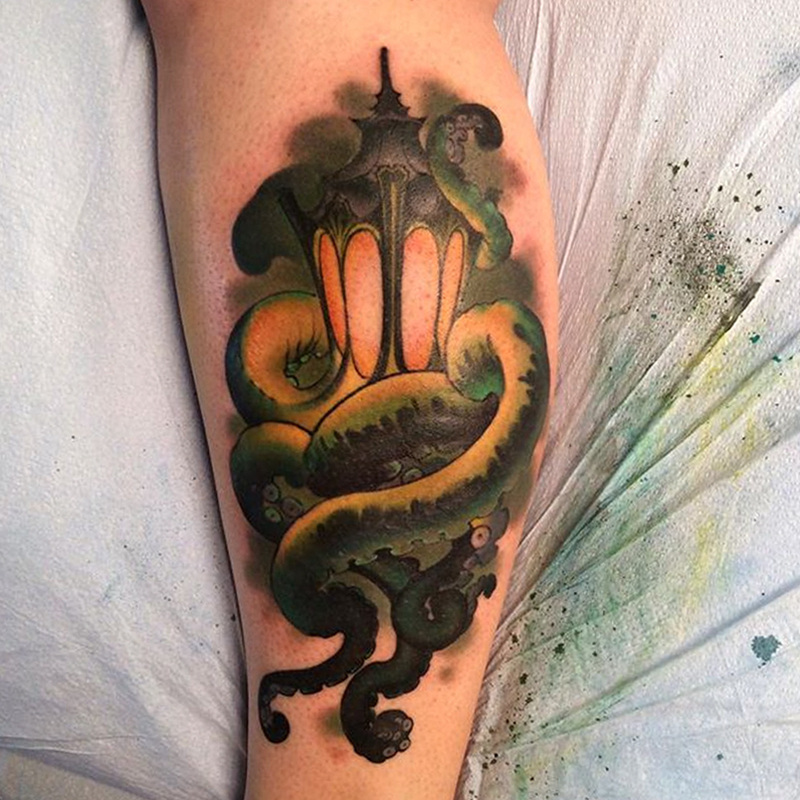 Having been in the tattoo industry for over 15 years, Chris Yoakum is well versed in an array of styles. His bold use of color and black outlines can often give his tattoos a slight Traditional feel, however Chris' work showcases influences from an array of styles, including Geometric, Watercolor, and Neo-Traditional. He works in both color and black + gray, and like most of our artists enjoys a wide variety of subject matter. Tayler has quite a few years and locations in his career's history. Before joining the Reclamare team in 2017, his home base was in Reno, where he spent several years traveling all over the US to tattoo in various cities across the country. Most known for his Neo-Traditional style, Tayler's work incorporates bold lines and a strong use of color. However in addition to his Neo-Tradtiional tattoo work, he is also influenced by Japanese, Irezumi, and westernized tattoo culture. Artists typically charge $140-$180 per hour. Please be sure to ask your artist through email or at your consultation to confirm their individual rates. Most artists at Reclamare take a $100-$300 deposit to schedule tattoo appointments. Deposits are based on size of the tattoo ranging from a simple 1hr tattoo up to larger scale work like sleeves and full torso or full back pieces. Unfortunately this seems to be the most common asked question when it comes to tattoos. It’s understandable that budgeting comes into play when investing in something, however we encourage everyone to see a tattoo as just that: AN INVESTMENT. Tattooing is very much an art form and as we all know, very permanent. It takes time. Quality work from well educated artists comes at a cost. This doesn’t mean that you have to break the bank when investing in a quality tattoo. There are many ways a good tattoo artist will work with a clients budget within reason. For larger scale tattoo work it’s all about consistency. Be sure to be upfront about what your disposable income is per month to make sure the artist can space out your sessions accordingly, that way the art stays consistent. Reclamare has accounted for the average pricing in Sacramento and come up with a shop rate that we feel is both fair and competitive, while simultaneously not undervaluing the integrity of our work. All artists operate their own booking schedules and standard days they operate. Reclamare is open 7 days a week from 12-7pm. Some artists will start earlier or work later based on the project. During holiday seasons hours are subject to change accordingly. Yes, BUT!!! It’s not very common. Please follow our artists individual instagrams to see if they have any last minute openings. Does you guys do piercings? Nope, sorry. But we highly recommend CHIEF PIERCING located in downtown sacramento. Are you accepting apprentices or hiring office staff? Reclamare Tattoo does not operate as a typical walk-in based tattoo parlor. This means that the shop operates more as an artist’s collective and studio. All artists schedule tattoo appointments on a submission based process. This means that when any of the artists books are open (more on that below) the artist or artist’s assistant will review emails with the required information and select those ideas that are most suited for the artist's style. Inspiration and styling are very important factors when creating one of a kind custom tattoo, and as such some ideas may not fall into a specific artists area of expertise or desire at the time. We encourage everyone to follow the artist(s) instagram account(s), and take a look at the current body of tattoo work on this website to get an idea of the work we each enjoy doing. Listed on each artists gallery page you will find a brief description of the styles of tattoo work we each specialize in. How do I know when or if the artists books are open? The availability of each artists schedule is listed in the gallery section of this website, as well as on the about section on their corresponding Instagram and Facebook accounts. *please note that if there is no booking info listed then its safe to assume that the artist is accepting new clients. In addition, if you email an artist and receive a reply that their books are closed, then they are of course closed. When an artist is ready to start booking new projects, usually most of them will announce it through their social media (Instagram, Facebook) as well as updating their status on this website. What information should I include when submitting my ideas? Does Reclamare have a waiting list? No. In the past we have maintained one, however due to the uncertainty of each artists schedule openings, how far out existing projects would have them booked, and fluctuations in style as all the artist develop in tattooing, it led to more problems than solutions. Can I bring a friend while I get tattooed? Yes, we allow only one friend or family member back with you during the tattoo. Please do not bring your entourage of family and/or friends with you, its very distracting and they will most likely be asked to wait outside. Please make sure to turn your phone on silent and use your “inside voice”. Please remember to be considerate to other clients and artists around you. Are kids or pets allowed in the shop? No, there is absolutely no reason a child of any age should not be hanging out in a tattoo shop. Especially for health and liability reasons. Only persons 18 years or older please. No pets allowed via the health department. Service animals are allowed.